Home → News & Articles → Ever wonder what Mercedes-Benz Stadium does with all its cooking oil? Ballgames and fried food go hand-in-hand, and when that ballgame is the Super Bowl, there’s going to be a lot of fried food. What many attendees may not think about is the roughly 8,000 pounds of cooking oil Mercedes-Benz Stadium uses in its 106 fryers. That’s where kitchen service company Filta steps in, filtering oil that can be salvaged and collecting spent oil to be recycled into renewable fuel. 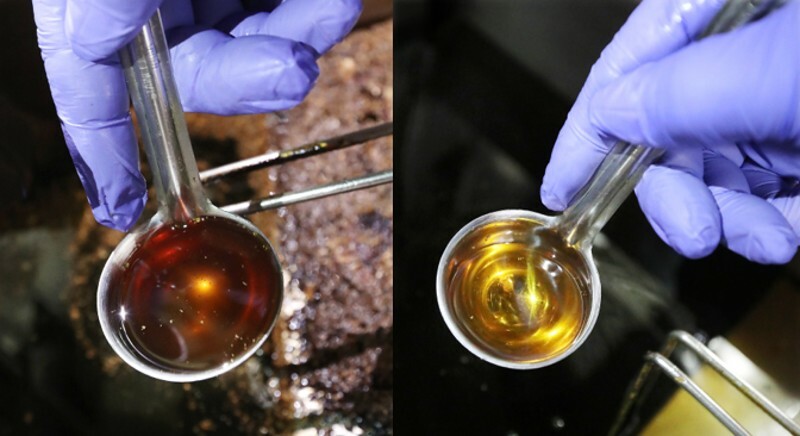 The company, which was founded in the United Kingdom in 1996 and moved stateside in 2003, uses microfiltration to extend the life of cooking oil. Its mobile filtration units send the oil through three stages, using both suction and pressure to filter out carbon and other impurities. “The best way I can explain it to someone on the outside is think dialysis for cooking oil,” Filta’s Chief Operating Officer Tom Dunn said. He said Filta’s goal is to cut the amount of oil his clients need in half by reusing filtered oil that otherwise would’ve been thrown out. When you’re talking about thousands of pounds of oil, the amount of saved resources adds up quickly. In 2018, more than 274,000 pounds of oil was saved at Mercedes-Benz Stadium alone, according to an environmental impact report Filta compiled. The company creates these reports for many of its major customers in metro Atlanta, which also include SunTrust Park, Grady Memorial Hospital, the Georgia World Congress Center and Georgia Tech, among others. 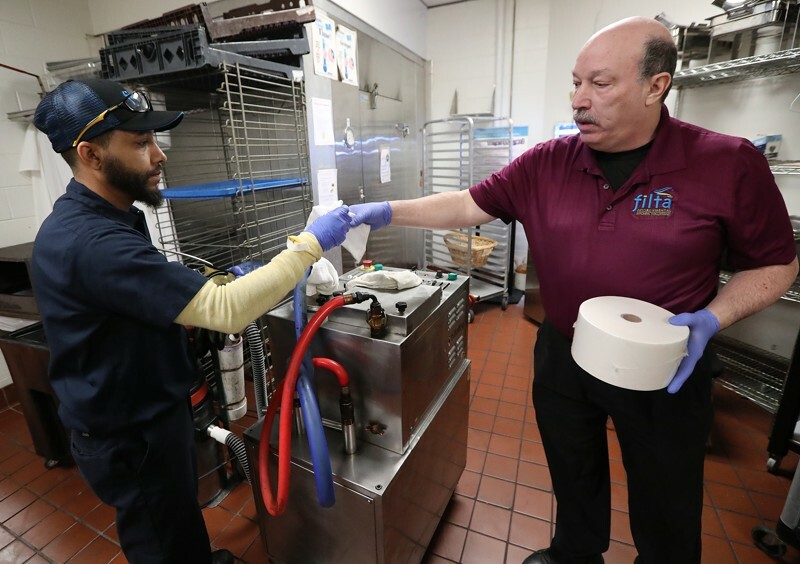 In the weeks leading up to Super Bowl LIII, Atlanta-area Filta franchise owner John Lopez said his technicians emptied every fryer, which mostly holds 90-pounds of oil each, to give each fryer a deep clean in preparation for the big game. Handling 350-degree oil can be dangerous, and less careful employees can easily end up burning themselves. That was actually the catalyst for the company’s founding. Dunn said Filta co-founder Jason Sayers was inspired after his friend was scalded at his part-time job at a fish and chips shop in England. Fry oil can’t be filtered and used forever, so it occasionally must be dumped. It can’t be poured down a drain — a lesson many home cooks have learned the hard way when faced with a clogged drain. These congealed oil blobs are called fatbergs, which can present huge infrastructure problems when they form in sewer systems. 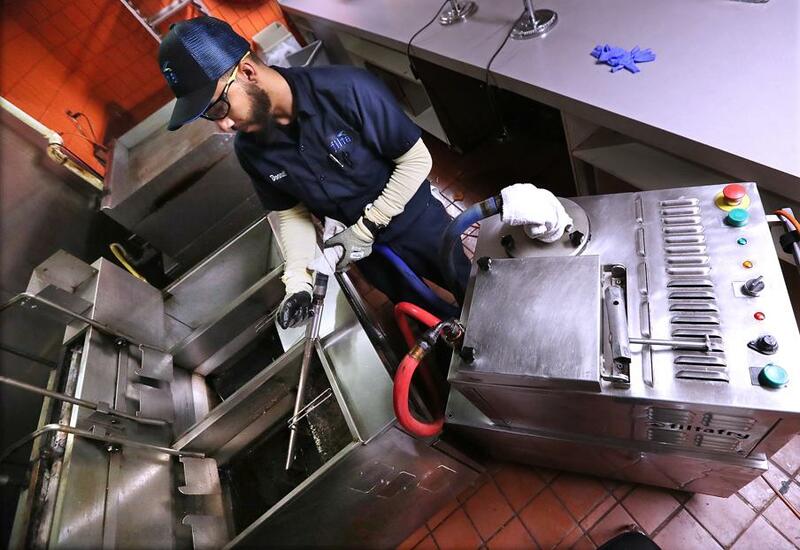 In an effort to prevent this, Atlanta’s Code of Ordinances requires businesses to obtain a food service wastewater license and install grease traps to capture any oil that finds its way into the drain system. Dunn said another service Filta offers helps eliminate the need for traditional oil collection bins, which can take pressure off existing grease traps. “Instead of having a dirty bin that can overflow, leak or end up getting into a waterway, we take it right from your fryer to our van,” he said. Lopez said the Georgia Dome was his first customer where he removed spent oil for them. He said the stadium’s general manager required it when they partnered in 2010. The dirty oil has to go somewhere, and Lopez sends his customers’ oil to Monroe-based plant Clean Energy BioFuels. The company’s manager, Rick Huszagh, said the oil is then recycled into biodiesel, mixed with petroleum and sold as an alternative energy source for diesel vehicles. 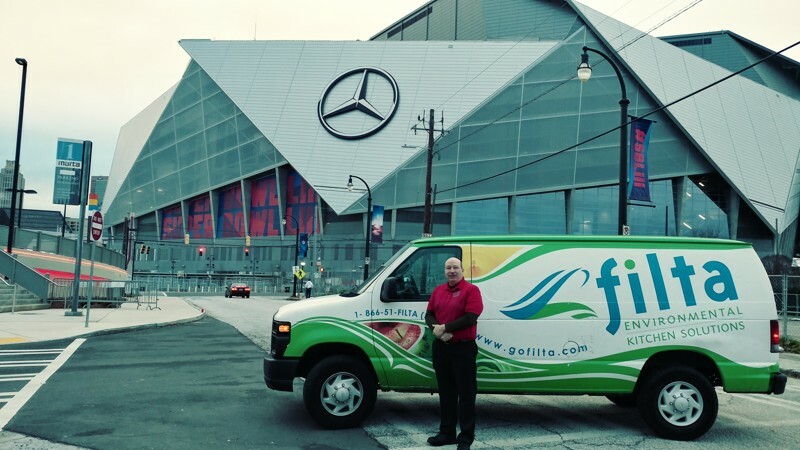 Filta’s environmental report for Mercedes-Benz Stadium said the oil saved from filtration had the carbon offset equivalent of planting 8,800 trees last year, and the recycling of oil into biodiesel was like planting an additional 14,145 trees. Large events, such as the Super Bowl, keep the oil flowing from downtown Atlanta to Monroe and eventually into gas pumps. So ordering that basket of french fries or crispy chicken can taste all the better. “All we want is for our customers to put out a consistent product. Don’t worry about the fryers — we got it,” Lopez said.